Have you ever stayed in a relationship (romantic, friendship, business-related, etc.) that didn’t meet your desire but you stayed anyway hoping that it would change because you saw the potential? It’s something that a lot of people have done as I have done myself. 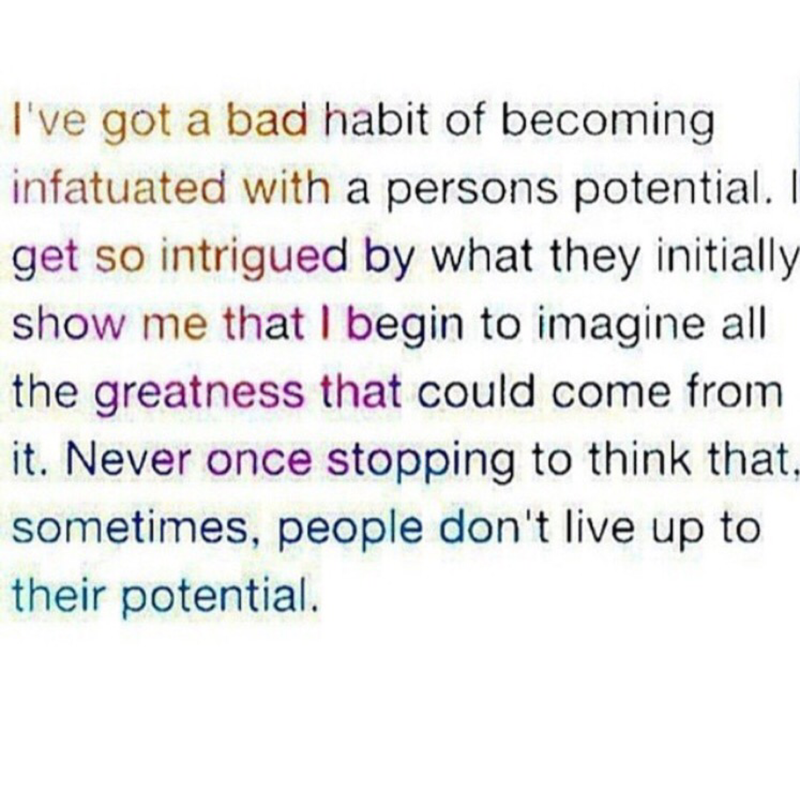 I always see the potential in people. Try to look past the little things and focus on the “what could be” aspect of them. What our future could be like if this, that, and that were different. I’ve recently learned how harmful that can be for the relationship and for myself as well. It is so easy to fall in love with someone’s potential and often times we recognize that maybe that’s all it will ever be. When you fall in love with someones potential, you forget to pay attention to reality. You make excuses for the things people do that you don’t like, you give a lot of chances to make things right, bypass your own wants/needs for the sake of what could be. What we fail to understand is that we can’t keep asking someone to change to suit our expectations because that’s all potential really is, “expectations”. When you expect things you end up disappointed. There is a thin line between asking someone to compromise and asking them to change who they are. If you constantly find yourself trying to change something about someone whether it’s their behavior, attitude, lifestyle, etc., or looking for ways that they can improve, move on. You will be doing both of you a huge favor by doing so. It’s tiring to keep voicing what you don’t like or what you want changed, and it’s tiring to keep hearing about it. We all want to be loved for who we are and not for who we have the potential to be. If you are in love with somebody’s potential just make sure you’re equally in love with who they are now. Once the potential outweighs the now you will find yourself in a very bad place. No one is perfect nor will anyone ever be perfect. You will always find flaws in your lover, friend, business partner or whatever the case may be and there will always be room for improvement. If you can’t love a person for who they are now or you feel like you’ve invested so much in their potential, walk away. Walk away because you will constantly find yourself upset when the potential you saw fails to manifest itself. You will eventually get tired of waiting for that potential and then you find yourself walking away from someone you love. It’s okay to see the possibilities and to look into the future and envision what your partner can become but you have to make sure that it doesn’t become the basis of your relationship. It can put pressure on your partner and can lead to resentment on both ends. I only speak from experience and I’ve been the girlfriend who’s constantly complaining about something or pushing for change in different aspects of the relationship. Only to end up disappointed and watching my relationship come to an end because of it. Sometimes we don’t realize our mistakes until it’s all said and done. I had to take a step back and recognize my own faults. Wants are very different than needs and what you may see as a “need” your partner may see as a “want”. Communication is always key no matter what. When you talk about things it leaves no room for misunderstandings. Be careful and mindful when falling in love or loving someone, ask yourself do I love them for they are, or who they have the potential to be. Thank you for reading, Be Blessed & Stay Humble.